Hitman Foundation looks for opportunities to work with people who are looking for assistance in expanding their lives. 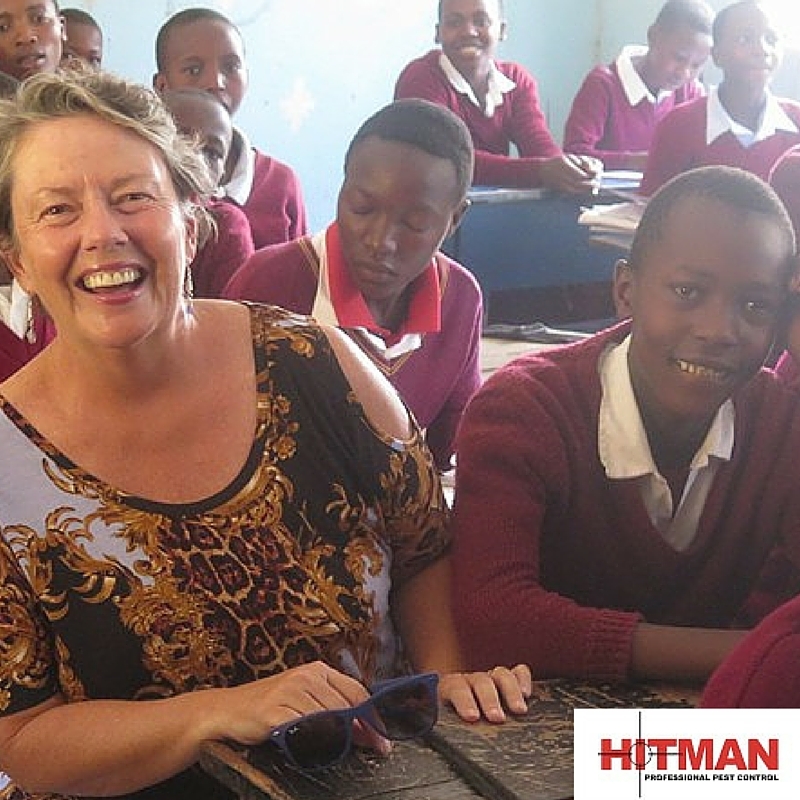 On a recent trip to Tanzania, Donna, co-owner of Hitman and Annette, Manager of Hitman, visited a primary school in Arusha. They found this beautiful school jam packed with energy and enthusiasm. The children and the teachers at this school were shining examples of individuals working together to benefit the whole. Ang’weni Damianus Lang’o is the Principal of Matim primary school. He is a man dedicated to changing the lives of children through education. Like many people, Lango’s passion and purpose were born through doing without as a child . This resulted in him wanting to make a difference in other people’s lives. Mr. Lang’o overcame remarkable challenges to pursue his own education. At the tender age of 5, his father passed away, leaving behind 7 wives, 51 children, and very little money or resources. Mr. Lang’o battled through childhood and on reaching high school was accepted into a school on the opposite side of Lake Victoria from his home village. This was many miles a way from his home. Away from his family, he learned to support himself and paid his school fees by doing chores and agricultural work for his teachers and the community at large. He passed his national exams in his last year of school but could not afford to enroll. He spent the next five years supporting his family as a farmer and working in Dodoma (the capital as it’s known today). Lang’0 accepted a place in a new government teacher training program in 2003. In 2008, Rick Smith, Co-Director of A is for Africa, met Mr. Lang’o on a visit to Ilkurot Primary. They had many discussions about the education system and providing the basic needs of rural primary schools in Tanzania. Improving the quality of education in Tanzania is Mr. Lang’o’s life goal. He believes that accessible education is necessary for building an equitable and prosperous country. At Matim, Mr. Lang’o seeks to reduce class size from 100 to 30 students per teacher and is also keen to add courses in computer skills, improve teachers’ living conditions and offer reading support to scholarship students. This is where Hitman saw an opportunity to assist Mr. Lang’o and his school by paying the salary of an additional teacher. The staff at Hitman pay this salary on a monthly basis directly to the school. Hitman has also recently funded the building of an additional toilet block at the school. Mr. Lang’o has already made notable improvements to Matim School. His leadership has supported the building of new classrooms, the commencement of a scholarship program, new book purchases and beginning a school lunch program. He is working closely with organisations such as A for Africa and Hitman. It’s Mr. Lang’o’s dream to initiate his own private school so that he can retain the same teachers for many years developing their skills during their long term employment. Mr. Lang’o lives with his wife of 16 years, his four children and two of his sister’s children. Lang’0 is passionate about his family receiving the best education. Hitman is privileged to be a part of this dream and looks forward to expanding alongside Mr. Lang’o and his wonderful team of teachers and children.